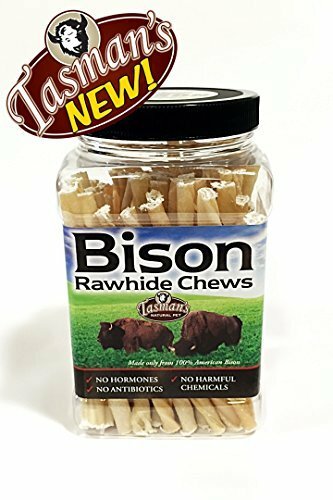 Tasman's Natural Pet Co is proud to offer a unique line of all-natural Bison rawhide chews. Don't mistake these rawhides as typical - they are far from it! These rawhide chips are made from US Bison which means no hormones or antibiotics are passed along to your pet. Tasman's Natural Pet Co. doesn't use any harmful chemicals in the manufacturing process either - another plus for your pet's digestive system! These rawhide twisters are great for dogs with allergies or for owners who want to provide their pet with an all-natural diet, even when it comes to treats! Be sure to check out all of Tasman Natural Pet Co.'s products as their rawhide chews also come in an Elk variety and both lines have a variety of shapes and sizes including chips, bones, rolls, twisters and rings. 75 Sticks per Sealed jar. If you have any questions about this product by Tasman's Natural Pet, contact us by completing and submitting the form below. If you are looking for a specif part number, please include it with your message.